Julian Ashton was one of the most influential figures in the Sydney art world from his arrival here in 1883 to work on the Picturesque atlas of Australasia. He took a leading role in the Art Society of NSW, which undertook art instruction and exhibitions for the most significant artists of the day and was an early Trustee of the Art Gallery of New South Wales (1889-99), where he championed the collection of contemporary Australian art by the Gallery. However it was the example Ashton set as a painter and as a teacher at his eponymous Sydney Art School (est. 1890) that was to have the most profound effect on a generation of ‘Bohemian’ artists who wished to forge a distinctively independent school of painters of Australian life and landscape. The subject of this atmospheric, poetic watercolour is the ferry wharf at Mosman’s Bay – a popular subject for a number of artists associated with the artists’ camps of Mosman in the 1880s and 90s. Situated in the next bay, Little Sirius Cove, was the artists’ Curlew Camp, and further to the north was the Edwards Beach camp, (today’s Balmoral Beach), where Ashton was a frequent resident. This watercolour was painted the same year his other watercolour, 'A solitary ramble' 1880, was acquired by the Art Gallery of New South Wales. Depicted in the centre of the painting is Lewis’s Refreshment Rooms, built next to the wharf and a focus of leisure for leisure and relaxation, although a place of comparative bustle and activity compared to the more isolated artists’ camps nearby. Ashton championed the practice of painting outdoors (en plein air); this work captures the impressions of nature – sunlight, haze, water – as well as the human activity by the foreshore, witnessed in all its prosaic everyday-ness by the artist in its midst. 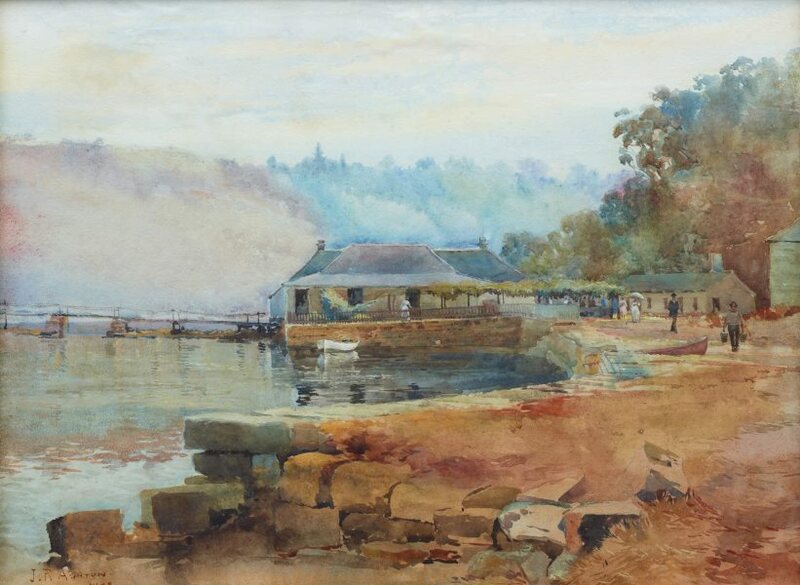 There are two known related watercolours of this subject by Ashton; one painted the same year, in the National Gallery of Victoria ('Mosman ferry' 1888), which takes as its central focus a ferry by the wharf; the other is 'Mosman Bay' 1883 in the Mitchell Library (State Library of New South Wales) collection, painted five years earlier from almost the same spot, with slightly sharper clarity and less sunny palette. Several of Ashton’s contemporaries depicted Mosman Bay; Tom Roberts famously painted the wharf in 1894 ('Mosman’s Bay', New England Regional Art Museum, Armidale). The Art Gallery of New South Wales has a watercolour depicting the same part of the bay with the buildings shown from a greater distance by John Mather ('Mosmans Bay' 1889), as well as an etching by AH Fullwood ('Old Mosman’s, Sydney' 1890). Signed and dated l.l., watercolour "J. R. ASHTON/ 1888".